NCAA Blowout - Items As Low As $6.99 + FREE Shipping (Reg. $20+)! You are here: Home / Great Deals / NCAA Blowout – Items As Low As $6.99 + FREE Shipping (Reg. $20+)! NCAA Blowout – Items As Low As $6.99 + FREE Shipping (Reg. $20+)! Hurry on over to grab some awesome deals on NCAA items!! Scarves, gloves, hats and more all showing your school pride! 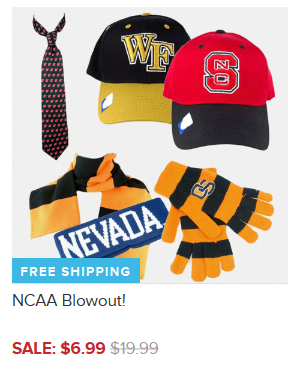 Head over to the NCAA Blowout where items are As Low As $6.99 + FREE Shipping (Reg. $20+)!